Sony has finally announced the update to the very popular and awesome Sony A6000 camera, the new A6300, due out next month, has been highly anticipated by Sony shooters and I personally can't wait to get my hands on this new camera. 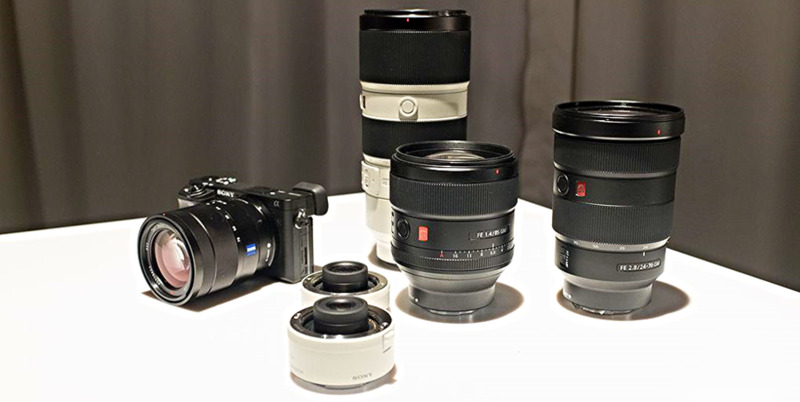 Maybe even more important to the future of the Sony E-mount system is the announcement of 3 new pro-level lenses and the new G Master line. The new A6300 is not a major leap forward in technology from its predecessor but a great next iteration. The new camera maintains the 24MP image size but Sony claims the new updated sensor is much improved and allows for very impressive 4K video resolution. The 6300 also maintains the super fast 11 frames per second capture in this small body. This challenges many of the higher end cameras on the market today. The new auto focus system on this camera seems to be the biggest selling point of this camera. the 425 phase detect AF points with the super fast AF system seems to blow the competition out of the water. Sony claims a 0.05 second autofocus, making it the "world's fastest." I can't wait to test out the new 4K video recording in this new camera. Sony is going head-to-head with the newly announced Canon 1DX with high-quality 4K video recording for a big fraction of the cost. With 14 stops of dynamic range and recording at 100Mps this camera should shine in video quality. Sony is planning to ship this camera in March with a starting cost of $1000 for the body and about $1,150 with the kit lens. As excited as I and many others are about the announcement of the new 6300, I believe the big story is the new G Master lenses. Sony unveiled three amazing new lenses: 85mm f1.4, a 24-70mm f/2.8 and 70-200mm f/2.8, all of which are going to appeal to many professional photographers. The release of these lenses put Sony's mirrorless lineup in full competition with some of the most popular lenses from Canon and Nikon. As a recent convert to the Sony mirrorless system I have been missing my 24-70 f/2.8 and my favorite Canon lens the 70-200 f/2.8. A lot of people have noted the absence of these lenses from the E-mount lineup and now they are here. These great lenses however will not come cheap. the 85mm f/1.4 will cost $1,800, the 24-70 f/2.8 will be $2,200 and Sony has not even announced a price for the 70-200 f/2.8, but you can expect it to be close to $3,000. Sony is continuing to push the photography world to new limits and pressure companies like Nikon and Canon to keep up. I look forward to getting my hands on these new lenses and see how they compare to Canon L series. If Sony can nail the lenses they will be hard to keep up with in the camera world. I recently picked up a new DJI Phantom 3 after looking over a number of reviews for UAV's. I have to admit my only disappointment after taking my new toy out this weekend is that I waited as long as I did. This thing in incredible, the video quality and smoothness is mind blowing and the ease of use was much greater than expected. Living in Washington, DC, I am very restricted as to where I can fly drones. The FAA has instituted a 5-mile no-fly zone radius around the city and areas that seem to extend even beyond that in which you are not allowed to navigate your aircraft. And I imagine in an effort to appease the government from future regulations, DJI does not even allow you to take off in these no-fly zones. So on Sunday morning I packed up my car and I drove out to Gettysburg, PA to film the snowy countryside and also to visit one of our nation's more historic towns. On a side note, if you have never ventured to Gettysburg, I highly recommend it. Not only is there a tremendous amount of history in this town, it is just a quaint little place. Getting everything unloaded and ready for the first take off. I have to admit I drove around a lot looking for a place I felt comfortable taking the DJI out for its first outdoor flight. I didn't want some angry farmer to pull his shotgun out of his pickup and blow it out of the sky, nor did I want the local police to haul me in for long questioning about what I was doing. So I settled on my first stop at the local high school and their very open and empty snow covered football field. It seemed like a great place to test the drone and not bother anyone. The location was a great success and I was able to build some confidence from my first flight. The drone takes off with the push of a button and just hovers, looking at you, waiting for you to fly it away. The FAA restricts these type of drones to an altitude below 400 feet. At first I thought that was pretty low but quickly learned it is plenty to get all the photos and video you will ever need. I think I got it up to about 350 feet and even then started to get a little nervous. DJI also states the Phantom 3 can fly about a mile away with the new light bridge communication system. On my first flight, I probably never flew it more than 750 feet away but there was never once even the slightest communications hiccup. I can't wait to take my UAV out again this weekend and push the limits of flight and video a little more. This is an incredible device not only for the fun of flying but for video quality. Below I have post two videos I shot on my first day, please let me know what you think. I had a interesting conversation with a co-worker this past week following the announcement of Apple’s new smart watch. I often forget not everyone has my obsession with tech gadgets and needs to try out every new thing as they come out. Many people have asked me over the past week if I will be ordering the new watch, which one I am getting and why I would want it. Well we all know that I will be awake at 3am on April 10, waiting for the Apple Store to start taking pre-orders. But the other two questions take a little more explaining. I have learned something from Apple as an early adopter of many of their products, the second generation is almost always a big step up from the first. I stood in line for the first iPad and then a year later for the second, wanted that camera. Retina MacBook Pros drastically improved in their second generation as did the AppleTV. I imagine the watch will be no different. The second generation will sure to be the “thinnest watch ever made” and probably be twice as powerful. While many people will wait for the second generation to begin with I will be online in the middle of the night to get my hands on the cheaper sport model. One thing very odd about this line of Apple products is the internals of each level seems to be the exact same. You buy a $399 watch or a $17,000 watch you get the exact same functionality. One may look a lot better but it will still do the same thing. As an early adopter who knows I will most likely purchase the second generation model I am opting for the lower end to start out. Google and Apple have both embraced the latest in USB technology. The USB cable has been around since the mid-90's connecting printers, scanners, cameras, phones and most other peripheral devices. One end of this cable has remained pretty standard, the other end has varied greatly depending on the product you are trying to connect. The possibilities that the latest USB standard brings to computer users is incredible. In the very near future anyone with a Mac, Windows machine or Google Chromebook could theoretically walk up to the same desktop workstation, connect one cable and begin working immediately. That one cable would provide power, display , network connection and any other peripheral devices connected by a single dock. Current products like the Belkin Thunderbolt Dock provide much of this functionality today for the Mac, minus the all important power. I currently use this Belkin Thunderbolt everyday to connect my Mac to my office workstation and my home. But I still have to provide a separate power source and it only works with my Macs. As with any new technology there will be some inconveniences as the technology becomes more prevalent. Users are already moaning and groaning about the need for more dongles. You will need special adapter to connect to any current portable hard drive, phone or accessory you connect to your computer. We are in a time of transition, much the way we moved from Apple’s 30 pin cable to the lightening adapter, the way we moved from micro to macro usb adapters. There will be nuances and annoyances in this process but as companies adopt this new technology the future of one connector for all you devices could finally become reality. The next big question is how will mobile adopt the new USB C standard. Google has already indicated that they will be working to include this in their future nexus devices. We have no idea if Apple, Microsoft or other handset makers will embrace this one connector technology. As an iPhone user I would love to see Apple pick up on this trend. I could unplug my laptop and charge my phone, I could charge my phone from my laptop, and the connector would be so universal it would be great to think that most place you go you could find the power cable you need. I am very excited to see the path that manufacturers take going forward on this new standard. I am pleasantly shocked to see Apple be such an early adopter on such an open standard and even indicated they won’t block any of the functionality to third party accessory makers. Hopefully by the end of 2015 we will all be able to share cables, connectors and ease of use across all platforms.